The signup flow is one of the most critical aspects of the user experience journey. It is the initial encounter that a user has with your product. The way you design it can have a major impact on how users perceive your product. In this article, I will be going over two popular SaaS signup flows: friction-based vs. frictionless signup. In short, a friction-based flow is one that will make it harder for the user to complete the signup process in exchange for more value-added later on. On the other hand, a frictionless flow will make it much easier to complete the signup process hoping that the UI is good enough to demonstrate the value of the app on its own. The number of steps to complete the flow. The number of fields to fill. When Should Friction-based Signup Be Used? Friction-based signup is more about collecting user information and pushing critical actions first. Therefore, it must be used when your product is too complex to demonstrate value on its own. This is generally the case for products that are not purely self-service and/or that require a bunch of integrations first to setup. Take for example the case study of FullStory. 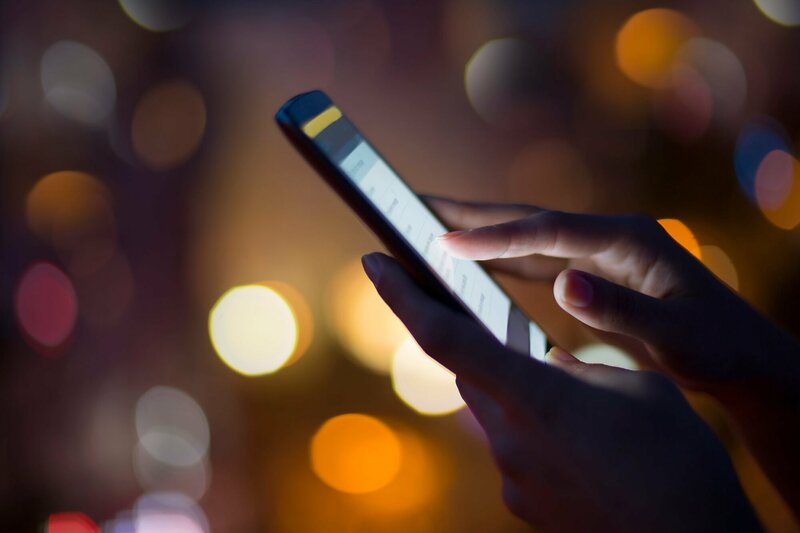 FullStory is a session replay software that helps you monitor how users are interacting with your app. For this reason, FullStory elects to go with a more friction-based signup flow. The idea is simple, make it harder to signup at first. Then, once the user completes all the necessary steps, they will go to the UI ready and find value almost instantly. 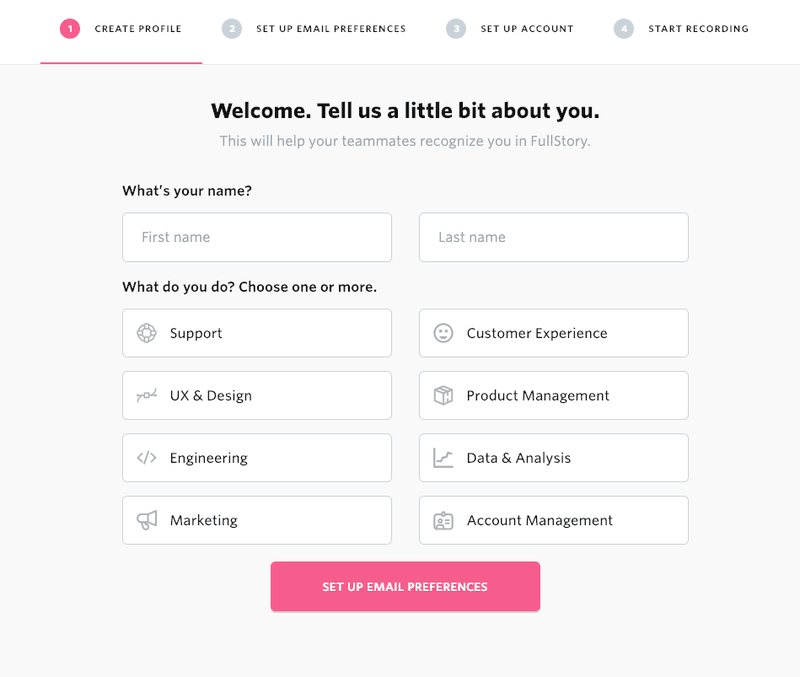 FullStory is also a product that can be used by various personas: product, UX and engineering teams to name a few. 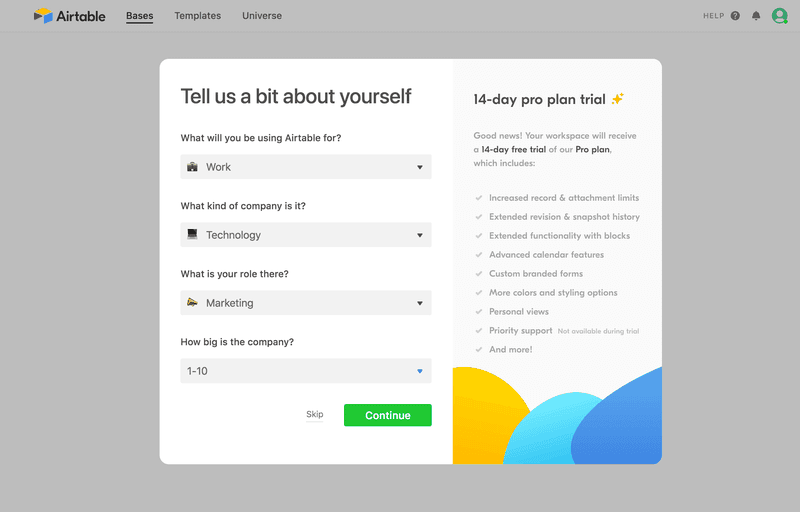 For this reason, they took the opportunity to learn more about the user persona as well in the signup flow. This will help them later to personalize the experience based on the data collected. Why does the friction-based signup flow make sense for the FullStory case? The product is complex to setup. The product is used by many personas for different use cases. But most importantly: You’re more likely to become a customer and activate the account if you go through all the steps. What Are the Advantages Of the Friction-based Signup Flow? Higher activation % after successful signup; users are more likely to activate if they go through the whole process. Easier to instigate the initial ‘Aha!’ moment after users reach the product’s UI. Differentiates serious users from spam signups. Eliminates spammers and adds a level of security; less abuse of the trial period. What Are the Disadvantages Of the Fiction-based Signup Flow? A lower number of successful signups. A higher number of dropouts during the signup process flow. Users don’t have a chance to experience the product’s UI. A frictionless signup flow is one that makes it easy for users to get as effortlessly as possible to the UI. Users don’t have to spend time filling up a lot of information. No installation and/or payment walls. No email verification in most cases. The idea is to get users to the UI as soon as possible and eliminate all kinds of friction. When Should Frictionless Signup Be Used? Easy to use products such as most B2C SaaS apps — the UI is simple enough to trigger the initial ‘Aha!’ on its own. No need for technical integrations for the product to be usable. If the product is targeted towards the lower side of the market…i.e. flies and mice. For this kind of approach, you’re basically banking on the UI to deliver the value needed to push users for activation. There’s no app that demonstrates this approach better than Airtable. The signup process is so frictionless that a user can literally get successfully to the UI in less than 60 seconds. 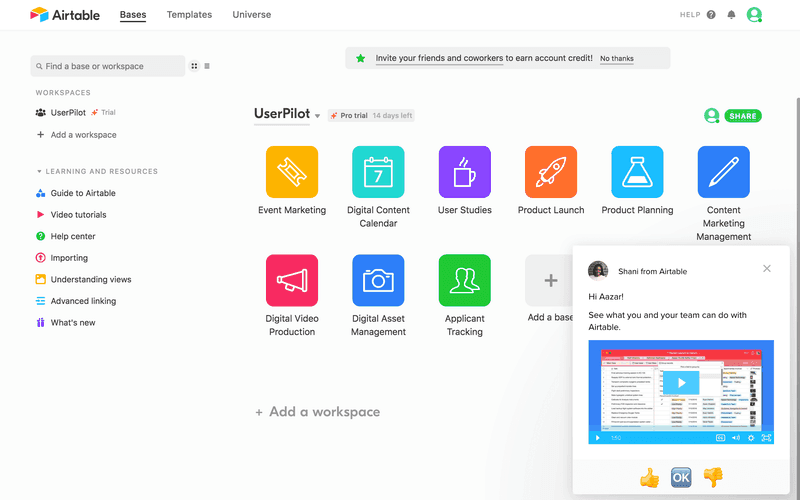 Once logged in, the Airtable team personalizes the content within the UI based on user persona. 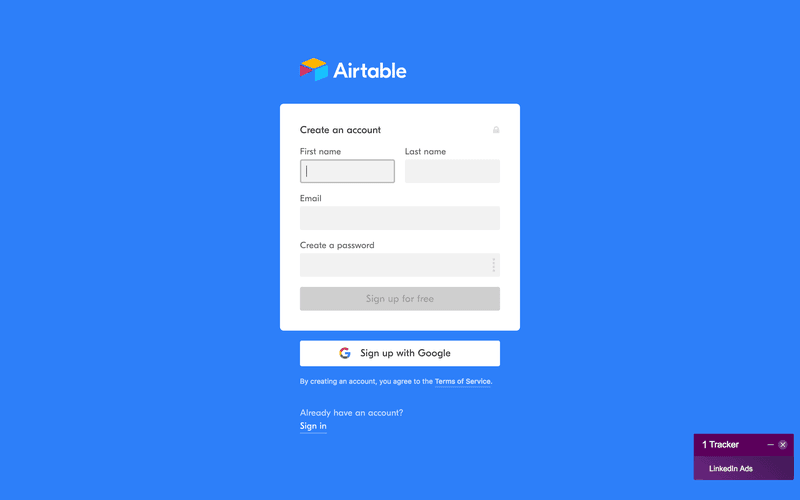 The frictionless signup flow makes sense in the Airtable case as the app is extremely simple to use and requires almost no integrations to work. In addition, the UI is so simple that it can achieve that initial ‘Aha!’ on its own. The UI itself will “motivate” users to complete the activation process. It could be anything like adding teammates, creating additional workspaces and so on. What Are the Advantages Of the Frictionless Signup Flow? Gets users to the UI quickly, and gives them a chance to find value on their own. Allows products to instigate that initial ‘Aha!’ without much hassle. Gives users a chance to go through the activation process at their own pace. What Are the Disadvantages Of the Frictionless Signup Flow? More spam signups and/or users abusing the trial. Less information about trial users. Users might find it difficult to continue the activation process on their own. Whether you decide to go with a friction-based or a frictionless approach, you should always remember to stay focused on driving meaningful actions. When a user signs up, their attention is so precious. You can think of it like air leaking out of a space suit – you want to make as much use of it as you possibly can while it’s still around. This goes beyond just removing friction – it means taking clear and meaningful actions that will motivate the user throughout the initial workflow. You would want to say, “let’s make a pizza, and we’re going to start by kneading dough and simmering sauce.” When you frame these two activities around the end goal, it helps the user understand why they’re important and builds motivation to complete them. In conclusion, you must stay clear on which goals you want the users to achieve and never stray off. Friction-based and frictionless signup flows have their own advantages and disadvantages. Both approaches work differently for different products. The trick is to find out which one is best suited for your product.